E3.Series 2014A has been released, bringing a number of productivity enhancements to the product, alongside new modules and enhanced import and export functionality. E3.eCheck helps you to identify errors early in the development stage to avoids costly development and production rework. It automatically ensures the schematic is functionally accurate and that wires and fuses are within the acceptable tolerances. As well as catching tolerance design faults, E3.eCheck also provides functionality checks. As the current flows through the circuit, loads activate or de-activate and provide immediate visual and audible feedback to the user on their behaviour and operational accuracy. When selecting the folder in the device tree, the highlight objects command will open the pages and highlight the devices from the selected folder. You can add more information columns in device trees for items such as supplier name, current rating, or any user-defined attribute. In the device tree, you can create your own icons to represent any attribute. For example, to represent parts differently in the device tree, all engine parts can have an engine icon. Grouped parts now maintain the ability for sub-circuit updates by retaining deleted elements of a grouped sub-circuit in the device tree. 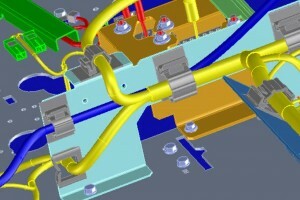 Even if you remove items from the schematic, the parts will remain in the device tree. It also enables the automatic update of sub-circuits when controlled from an external module. Enables mass component editing/updates in a component table. Works for any component attribute. Plug-in enables preview of E3S files with sheet up/down, zoom and pan available. Standard functionality across E³.series. This works in standalone mode (not multi-user). 3D placement of components in free space with no mounting required, as was previously the case. Manufacturing enhancements now allow simple export of punching, drilling and cutting details. You can now import DXF files into E3.schematic and view the data they contain. This functionality supports all DXF versions. You can also exclude certain devices from the DXF file. You can also determine graphic levels for outlines, drill holes, cut-outs and restrictions. Drill-holes can be defined for ducts and DIN rails, so you can set holes size and spacing, and decide where the holes will be for mounting the duct and DIN rails. E3.Series can now create an XV2 output for the Lattice 3D viewer, allowing you to view E3.panel 3D assemblies outside the E3 environment. From there, Lattice XVL studio can create panel manufacturing instructions. XVL files are extremely lightweight and can be opened on many systems and devices. They can be embedded in other documents, such as Microsoft Office formats, and easily distributed should that be required.